Over the next few months, our pottery specialists Julie Lochrie and Adam Sutton will be building up the big picture of prehistoric pottery production and uses in Cambridgeshire and its uses through time by looking at some of the several tonnes uncovered during archaeological excavations for the Cambridge to Huntingdon improvement scheme. Adam and Julie are both highly trained experts who analyse ancient pottery and answer questions about dating, source, techniques, the people who made it and the way it was used. Adam specialises in Iron Age and Roman pottery and Julie in Bronze Age and Neolithic pottery. In this blog, we find out more about their fascinating work. Why do we study prehistoric pottery? Adam: Pottery is one of the most common finds on later prehistoric sites and it’s a really good tool for dating a site as we can compare it with known, dated examples from other sites. Ceramics were used for storage, cooking, for moving produce like grain or milk, or as cremation urns, so they provide evidence of what every day life was like. 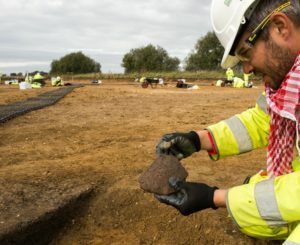 Is it rare to find prehistoric pottery in Cambridgeshire? Julie: Prehistoric pottery has been found on many A14C2H sites, with evidence from the middle Iron Age onwards (300 to 100 BC) being especially common. It’s mostly from small farms, with some from ceremonial sites and burial grounds. 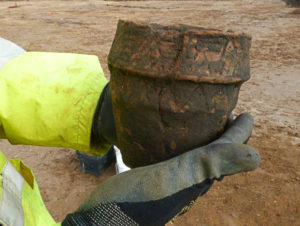 Collared urns like this one dating to the early Bronze Age (circa 2,200 to 1,550 BC) have been uncovered. This one is particularly interesting as it is associated with a henge near Brampton, Cambridgeshire – it’s rare as it is all in one piece. These vessels are almost always used as urns for human cremation. This is the earliest type used during a popular trend for cremation which spans most of the Bronze Age. This one is decorated with zig-zag patterns scored onto the surface with a sharp stick or similar tool. Adam: Prehistoric pottery was mostly made using the coiling technique, by placing slabs, rings or coils of clay one atop another and then smoothing them together and, the surface decorated in a variety of ways. During the late Iron Age (1st century AD) potters started to use a wheel to make their pots, probably because it helped the shaping of coil-made roughouts. Not all local potters changed to this technology – some continued with the hand-built traditions of generations of craftspeople before them. Was pottery made in the home or traded? Adam: Most prehistoric pottery in Cambridgeshire varies in quality and was probably made at home, most likely from local clays. Occasional examples of pots made elsewhere are found – these are identified from their style or materials. They may have passed between friends or relatives, perhaps as gifts or because of their contents. This bowl’s shape gives a likely date of late Bronze Age to early Iron Age period (c. 850 – 300 BC). The clay is black with white shelly speckles –probably natural to the clay and not filtered out before the pot was made. The potter has folded over the clay after coil-building and stuck it down, so as to round off the rim. Close examination even reveals indentations from the fingers of its prehistoric maker – an incredible personal connection to humans who lived thousands of years ago. Can you tell us about prehistoric pottery decoration? 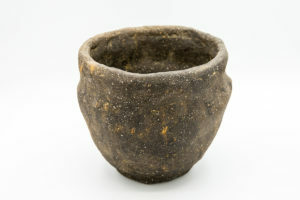 Adam: Scored ware usually dates to the middle and later Iron Age (about 300 BC 43AD). This large sherd was found near Brampton and shows that pottery from this period often had surfaces roughened by slashing the soft clay. This mid to late Iron Age (around 300 BC to 43 AD) scored ware vessel was turned upside down and deposited within a pit in the centre of a roundhouse. This possibly represents a symbolic ‘closing’ of the building. The slash marks are characteristic of local styles and the mottled colours were produced by uneven conditions from a bonfire firing.